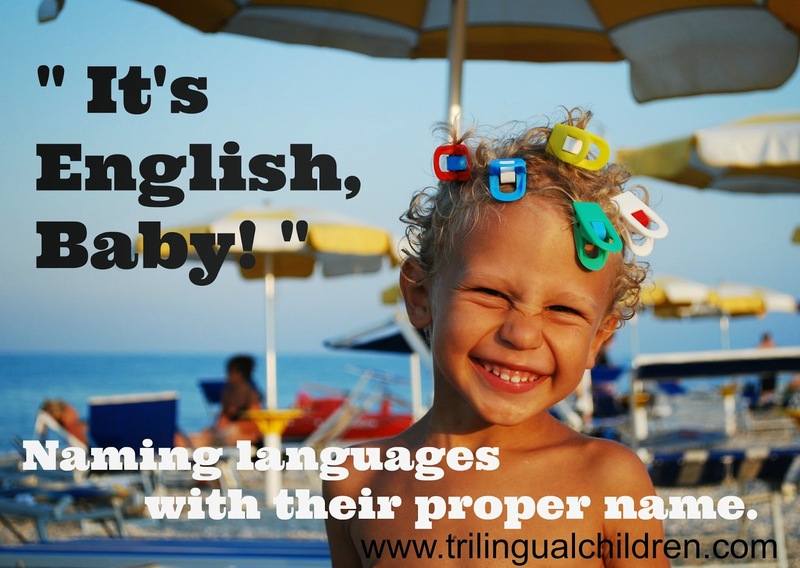 Google+ Raising a Trilingual Child: Naming languages with their proper name. My son hardly ever mixed the languages. I see that my daughter is doing not so bad either. I am thinking, what if this is also because I tried to be very clear to them from day one and called the languages with their proper name? I started with saying that the father speaks Italian and I speak Russian. When I speak to your father I speak English. I made an example of how one word sounds in different languages. When I was talking to my friends and relatives I would name the language we were speaking. Skype was very helpful here as well. Later I was adding a little geography, saying that in America, people speak English, in Germany people speak German, in Russia people speak Russian, in Italy - Italian, and that there are many other languages. I would tell what language the people whom children know (grandparents, cousins, ants, uncles, friends) speak. We always need to remember that our children do not have a base knowledge yet. I might be somewhat mistaken, but clarity will do only good to your child. We can avoid using abbreviation like "father's language" and "mother's language". After all our children learn from us, and if we say that language is Italian, they will get it, and there is no need for simplification. The kids are smart. How to prepare yourself to be a speaking model for your child.